Attending trade shows and conferences can get costly very quickly, especially when it comes to your company’s tradeshow display. 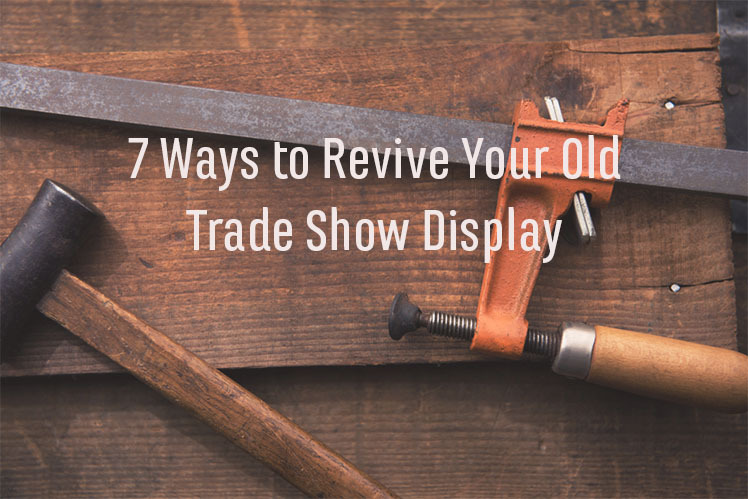 If your trade show display has started to show wear and tear, you can save a lot of money by sprucing it up instead of buying a brand new one. This way, you can stay on budget and give new life to an old design. New Graphic Designs—If you’ve had the same graphics for the past few years, you might want to give it a facelift with some new graphics. This would be a good time to test out new marketing messages or incorporate new design elements. Reprint and Replace Fabric Graphics—If your heart is set on your current logo and graphics, a simple reprint on new tension fabrics is a cost effective way to instantly spruce up your trade show display with vibrant colors and high quality printing. Many trade show booths are designed with interchangeable panels that can be easily replaced, making it an inexpensive way to give your trade show display an instant makeover. Incorporate New Furniture—Gone are the days of foldable chairs and plastic tables. If you will be conducting meetings or hosting important guests at your booth, consider adding furniture to your trade show booth. Once you add furniture that aligns with your company’s aesthetic, your booth will have a sense of balance and comfort, enticing those who want to talk to you. Include a Theater Viewing Space—Most trade show booths are designed in a way that makes it easy to include additional trade show booth items such as large monitors on the back walls. This way, you can give your old trade show booth an instant update with presentations that go beyond the graphics of your display. For example, last year, an exhibitor at the IFT Food Expo in New Orleans did a popular social media presentation with the help of large computer monitors in their innovative theater viewing area. Incorporate a Hanging Sign—Most attendees tend to look up when they walk onto the trade show floor. If you have an island booth or a peninsula exhibit, consider incorporating a hanging sign to your existing trade show display. Go Tall—If you don’t want a hanging sign or can’t afford one, a great alternative is to make your display taller. Taller exhibits are always the first to be noticed among smaller displays nearby, so consider adding a maximum height tower to your display. Upgrade Your Fooring—Today’s trade show flooring options offer much more to exhibitors than they did in the past. Exhibitors can choose from a variety of flooring options, such as artificial turf, raised wood flooring, carpet, or even an eco-friendly option to give their booth a cohesive look and feel, as if the booth is an extension of their office. In order to maximize your resources and make a lasting impression at your next convention or trade show, a few well-thought out updates can turn your booth into an eye-catching spectacle while staying on budget.